In keeping with my “Creative Challenge” July theme, I felt I wanted to do just a mindless bit of creativity. 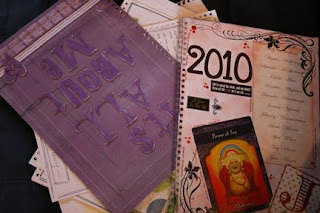 Quite a while ago I started a “creative journal” called “All About Me”. At first I was all enthusiastic about this project then quickly became a bit overwhelmed as just which direction to take and what to include. At the same time I was still caring for my Dad and spending time with him was way more important. I did a couple of pages and then to my usual form put it away to do “one day”. So now is the time for me to get my journal out and just do it. I decided to sticky note pages with the letters of the alphabet and then just do a page for a particular letter as the creative light bulb went on. Today I completed an “M” page for my Medicine Wheel for 2010. It is such a relaxing experience just sitting and letting your creativity flow. Shane headed of to Darwin today for his annual 10 day break. He goes every July with a group of about 8 other “blokes” and they spend their 10 days, going to the footy, going to the races, eating and I would imagine getting quite a lot of drinking in. He has a great time but I must admit it is nice to have the house to myself for the 10 days. I always give myself some project to complete while he is away. My ten days this year I am going to sort through all the paperwork, old magazines, recipes and miscellaneous paper items I have sitting on the table next to me. How exciting to have ten whole days to do what you want to do! I think that it's awesome to journal, it's a very creative place to be real, to vent or to express exactly what and how one feels. I love the Medicine Wheel, when I feel like my life is slipping out of sync I revisit the wheel and see where I must find balance in my life. Have a good time sorting and doing as you choose to do Davine, if you only get this opportunity once a year make the most of it!